We're also joined by Daniel Dorr, a Worldwide Solutions Manager for HP Enterprise Marketing. The discussion is moderated by Dana Gardner, Principal Analyst at Interarbor Solutions. 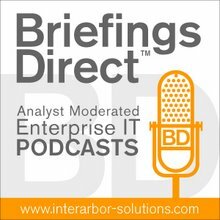 [Disclosure: HP is a sponsor of BriefingsDirect podcasts]. Gardner: What was the idea behind doing this survey at this time? We wanted to understand the difference between market leaders, from a revenue perspective, and market laggards or followers, and see what their IT environments looked like. We surveyed 688 organizations. We spoke to IT decision makers, so we would call that "CIO minus one." We didn’t speak to the CIO directly. We spoke to the people that reported to him or her. The results came into us in December 2011. So this is pretty accurate and up-to-date data. Gardner: How about some of the top findings? Dorr: I agree completely with Joel’s points. If you think about it, there were seven key attributes that rose to the surface for market leaders, revenue leaders, and revenue followers. Dobbs: I would add one thing. Daniel pointed out that there is increasingly a competitive advantage. The competitive advantage becomes not just doing it, but doing it faster than your competitors and being able to understand the meaning and the application of the data ahead of your competitor. Gardner: For the benefit of our listeners and readers, Daniel, maybe we could just go through the list at a prioritized basis, with descending priority, on what distinguished the leaders over the laggards. I think the top one is security as we mentioned, but let’s just go through it on a list basis, so they can get a sense of the importance. Gardner: So we've got some interesting takeaways here about the role of modernizing, gaining visibility, measuring along the way, being comprehensive in how IT approaches these problems, being responsive to the business on the business terms rather than the technology terms, with an emphasis on culture as well and the people and the process.